Fans of BaoziInn Romilly Street, the authentic Northern Chinese street food restaurant famed for its Cantonese fusion dim sum, will be excited to hear that there’s another site launch in the pipeline. This time it’s something rather different – a permanent stall at Victoria’s revamped Terminus Place, set to reopen in early November as Market Hall Victoria. Terminus Place has a colourful history. Since 1909 it has been home to everything from an Edwardian shopping arcade to a restaurant and most recently, the super-club, Pacha. The beautiful colonnaded structure has now been transformed by design team extraordinaire, Market Halls, to showcase diverse talent from the worlds of food and drink. 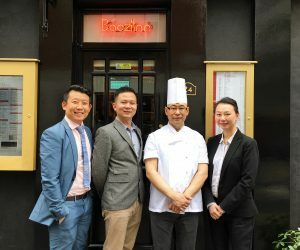 The BaoziInn stall will focus on producing the incredible all-day Cantonese dim sum with Hunan and Sichuan influences that the restaurant has become known for, namely those perfect, photogenic steamed dumplings, dyed with spinach, beetroot and turmeric juices to create their natural jewel coloured appearance.